The federal government released its third National Climate Assessment today. 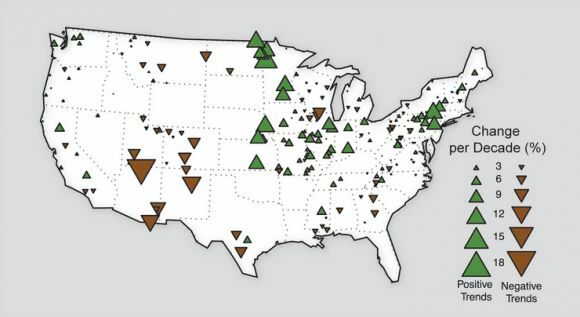 The 800-page report, authored and reviewed by hundreds of scientists, details how a changing climate is already impacting human health, agriculture and ecosystems across the U.S. The report also highlights alarming data about the threat of storms, droughts, heat waves and other severe events that could disrupt energy infrastructure. "Extreme weather events are affecting energy production and delivery facilities, causing supply disruptions of varying lengths and magnitudes and affecting other infrastructure that depends on energy supply. The frequency and intensity of certain types of extreme weather events are expected to change," conclude the report authors -- including an expert from the oil major ConocoPhillips. That warning comes weeks after the United Nations released its latest report concluding with "very high confidence" that growing extremes in weather are being influenced by human activity, thus creating new risks for energy systems. 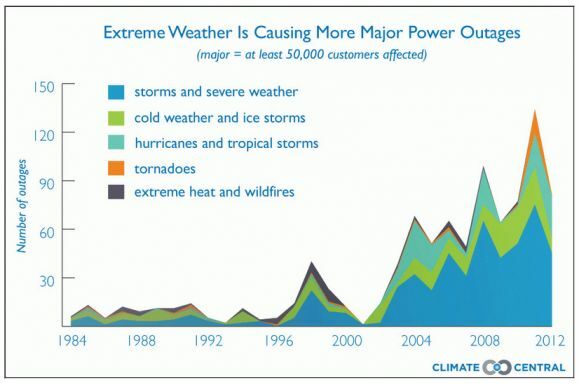 Below are five charts on extreme weather that should worry utilities. First, a little detour to put the issue into perspective. According to a new report from Climate Central analyzing data from the North American Electric Reliability Council, 80 percent of major outages since 2003 have been caused by extreme weather. This is very consistent with data from the Energy Information Administration, which also reported last year that 87 percent of outages from 2002 to 2012 were weather-related. As documented above, most of the power outages are being caused by "conventional" storms that are getting far more intense. 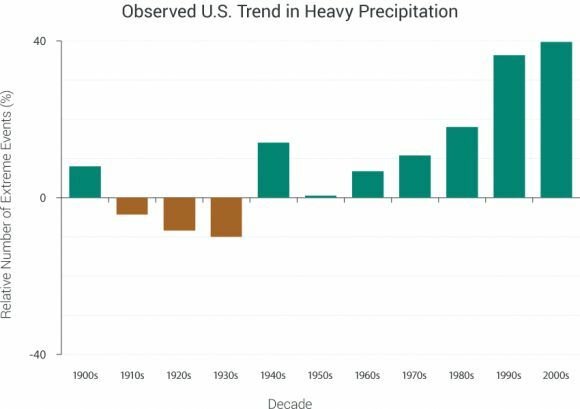 According to the National Climate Assessment, average rainfall during heavy precipitation events across the Northeast, Midwest and Great Plains has increased by 30 percent since 1991. The Climate Central report also observed a surge in storm-related threats. Since 1951, heavy downpours have increased in the Northeast U.S. by 74 percent, in the Midwest by 45 percent and in the Southeast by 26 percent. And since the 1980s, there has been an increase in the number and strength of Category 4 and 5 hurricanes forming in the Atlantic Ocean, even though few have made landfall. Precipitation changes have, naturally, increased flooding risk in the Northeast and Midwest. That could cause serious problems for power plants, particularly nuclear stations along waterways. According to a 2011 report from the Nuclear Regulatory Commission that was made public in 2012, there are nearly three dozen nuclear reactors at risk of being flooded due to dam failure. Over the last few summers, record temperatures have pushed the grid in Texas, the Mid-Atlantic and Northeast to its limits during peak times. But that's just part of the problem. According to the National Climate Assessment, the number of cooling days will increase between 37 percent and 90 percent through the middle of the century, depending on the region. "Higher summer temperatures will increase electricity use, causing higher summer peak loads, while warmer winters will decrease energy demands for heating. Net electricity use is projected to increase," concluded the authors. Global sea levels have risen by 8 inches since the late 1800s. That seemingly small rise already has consequences. 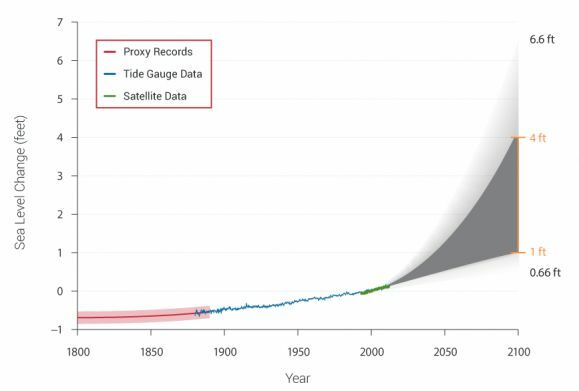 According to a 2013 study from the Bulletin of the American Meteorological Society, the risk of Superstorm Sandy-level flooding has doubled since 1950 (PDF). And sea levels could rise by as much as 4 feet by the end of the century -- dramatically increasing the odds of a disaster like Sandy, which destroyed power infrastructure and left more than 8 million people without electricity. "Rising sea levels, combined with normal and potentially more intense coastal storms, an increase in very heavy precipitation events, and local land subsidence, threaten coastal energy equipment as a result of inundation, flooding and erosion," wrote the authors of the report. The conclusion: without a major drop in emissions combined with a coordinated effort to prepare for more storms, the U.S. power sector will be in for more frequent disasters that exceed the damage from Sandy. 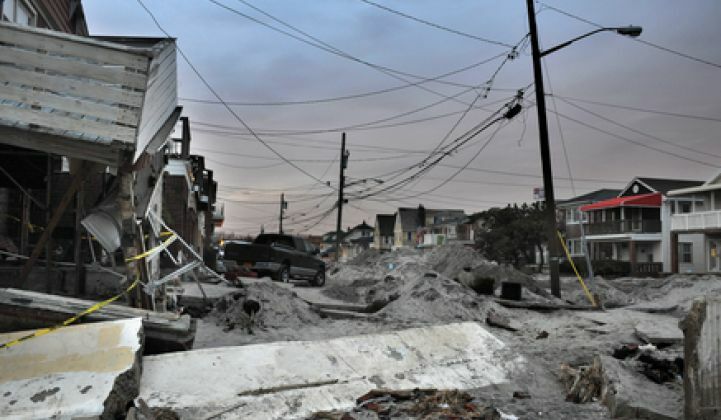 We'll be releasing an ebook on the post-Sandy legacy in early June. In the meantime, check out this information about our Grid Edge Live conference in San Diego June 24-25, where we'll have a session about resiliency and extreme weather planning in the utility sector.